Grate the potatoes, onions and carrots. Honestly, I find the food processor to be the best and fastest way to go. Place the grated veggies in a large bowl and cover with cold water. Let them sit for 5 minutes. Then, taking handfuls of the vegs, squeeze out all the liquid and lay on a towel (or 3 layers of paper towels). Roll up the towel and twist it to get rid of the excess moisture. Discard the water in the bowl, but leave a little bit of the starch that has pooled at the bottom. Put the grated vegs in the bowl. Heat up 1/4 cup of oil in a large, heavy skillet over a medium high flame, until hot but not smoking. 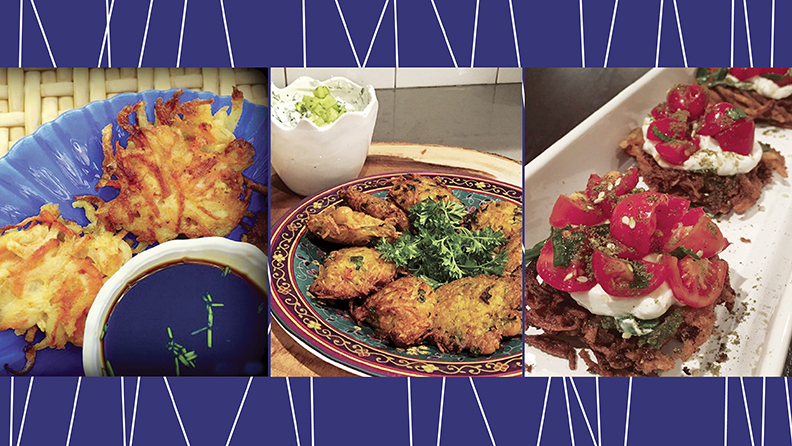 Work in batches and fry up your latkes. Depending on the size of latkes you are making, spoon the batter into the pan in mounds, then press down with a spatula. Turn the heat down to medium. Once you notice the edges turning brown, flip the latkes. Brown the other side (around 3 minutes). Drain the latkes on a paper towel lined baking sheet.and sprinkle lightly with salt. To keep them warm, place the latkes on a wire rack set in a shallow baking pan in the oven set to 300 degrees. Note: To make ahead – lay the latkes on a baking sheet, cover with foil and then plastic wrap. Place in the freezer. Then, heat them up in a 425 degree oven for 15 minutes before serving. Stir together the tamari/soy sauce, water, rice vinegar and sugar until the sugar dissolves. Stir in the scallions right before serving. Note: You can make the sauce (without the scallions) three days ahead of time and keep it chilled and covered. Add the scallions in after you’ve brought it up to room temperature. 1/4 teaspoon crushed red pepper. Grate the potatoes, onions and carrots. Place the grated veggies in a large bowl and cover with cold water. Let them sit for 5 minutes. Then, taking handfuls of the vegs, squeeze out all the liquid and lay on a towel (or 3 layers of paper towels). Roll up the towel and twist it to get rid of the excess moisture. Discard the water in the bowl, but leave a little bit of the starch that has pooled at the bottom. Put the grated vegs in the bowl. Blot off moisture from cucumbers with paper towels. Toast cumin seeds for a few seconds in a small, heavy frying pan over high heat. In a bowl, stir yogurt until it is smooth. Mix it with the cumin, garlic and cilantro. Combine mixture with cucumber and chill before serving. Falatkes — the most Israeli way to eat latkes! Make the falafel batter: Put all the ingredients in the bowl of a food processor. Pulse until the chickpeas are pulverized but not pastey. But, since we’re stuffing these into latkes, if you get pastey, don’t worry! Next, make the latke batter: Peel the potatoes and be grateful that you’re not outside on KP duty somewhere in the frozen tundra! Grate the potatoes and onions separately, whether by hand or by food processor. Place grated potatoes in a bowl with cold water. Let sit for two minutes, then drain. Place potatoes and onions in a towel (or triple thick paper towels) and squeeze all the liquid out. Place back into a bowl and mix in the egg and salt. Put it all together: Heat 1/4 cup of sunflower oil in a large pan over medium high heat. Using a teaspoon, take a bit of falafel batter and coat on both sides with the latke batter. Using the spoon, delicately place the falatke in the pan. Reduce heat to medium. Cook until undersides are browned (around 4 minutes) then flip. Cook another four minutes until both sides are done. Transfer to paper towels to drain. In a pan over medium heat, toast the sesame seeds until fragrant but not browned. When the sesame seeds have cooled, pulse them in a food processor until a paste forms. Add the oil, salt, garlic and lemon juice and puree until smooth. If the mixture is too thick, add water until you reach the desired consistency. Michal Levison, who is Israeli-American, lives in Franklin Lakes with her husband and two daughters. She is the owner of a home-based business, Seasoned Moments, and gives cooking lessons, both privately and to groups. 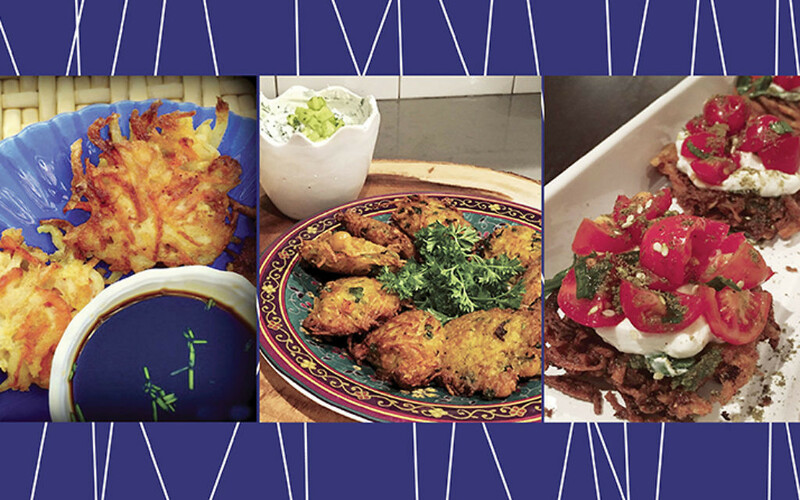 She was inspired to create the Japanese-style latke and the curried latke as a result of her travels to the Far East and India. Because one of her daughters loves falafel and the other latkes, she decided to create the falatka, which incorporates both.